Using Android, it’s easy to connect to multiple Wi-Fi networks, so you’ll never have to connect to the web when you arrive home as the device is already connected. With Android, it’s incredibly easy to set up separate home and work Wi-Fi connections, so whenever you walk through the door your Android device will automatically connect without even asking. Explore the Market and you’ll find exciting third-party apps that add even more functionality to your smartphone. Follow us over the next two pages as we explore the various Wi-Fi options built in to the Android OS, and take a look at some free apps intended to make life even easier. Discover some great apps that automate connecting to free Wi-Fi Networks. As you read this there’s a high chance that multiple Wi-Fi connections are available all around you. 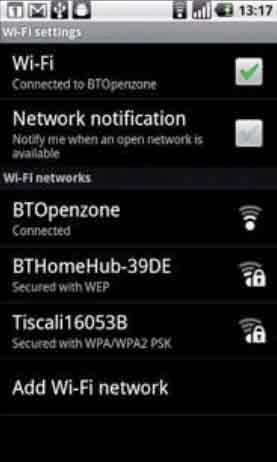 To find out if that’s the case, tap the Menu key on your Android device, choose ‘Settings’ and then ‘Wireless & networks’. 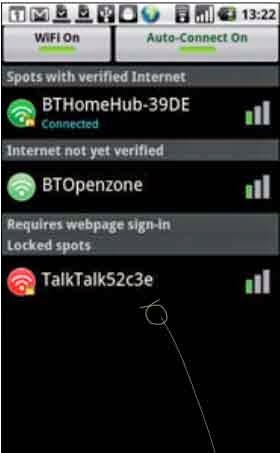 If Wi-Fi isn’t already enabled, check the tick icon to begin. 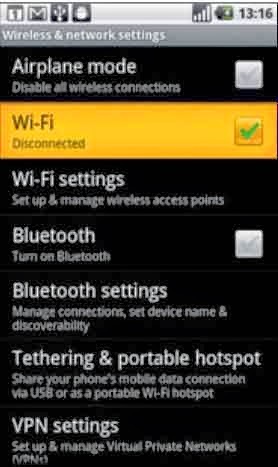 Tap ‘Wi-Fi settings’ and you’ll see any available connections. Tap on one to connect. If it’s an open connection then a network signal will automatically begin. Otherwise, enter the password to connect. You’re now connected to a Wi-Fi connection. Every time you enter its radius your device will automatically connect, so you’ll never have to enter the password again. To disconnect, tap and hold on the connection, and choose ‘Forget network'. To rescan for available connections, tap the Menu button and choose ‘Scan’. By tapping ‘Advanced’ you can enable the Wi-Fi connection to stay permanently connected, never turn off when plugged in, or only turn off when the screen is turned off. You’ll also find various IP settings, including the ability to use a static IP, enter a new IP address, DNS settings, and Gateway settings. These settings are only recommended for network professionals or people who really know what they’re doing. 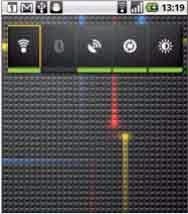 You can also connect and disconnect from Wi-Fi connections using the Power Control widget. To add it to your home screen, press the Menu key, choose ‘Add’, then ‘Widgets’, then tap on the Power Control widget. 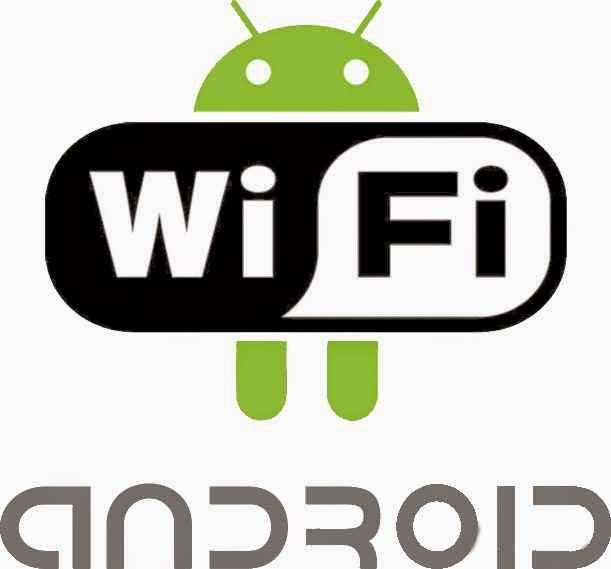 Within the Android Market you’ll find a number of Wi-Fi apps that make life easier for connecting to various networks. WeFi is a fantastic app for connecting to free Wi-Fi connections, the type you’ll find in coffee shops, other public businesses, or those who enjoy sharing their home connection. WeFi automatically connects to the strongest free Wi-Fi hotspot, saving you having to manually connect. The app references a constantly updated database of free hotspots to determine which are the best available connections. 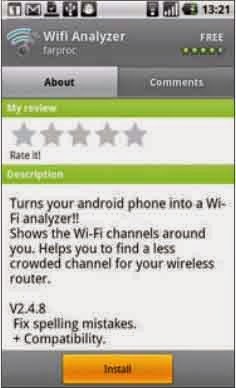 Another great free app is Wifi Analyzer. 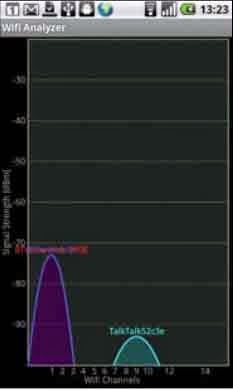 It shows all available hotspots on a graph by signal strength and interference. If the graph is crowded with too many signals then it’s also possible to view the connections in list form. Settings Wifi Analyzer is packed with clever touches. Via the Settings menu you can alter the graph colours, rescan for connections, keep the screen turned on, automatically connect to networks and also disable the banner ad at the bottom of the screen, if that bothers you.